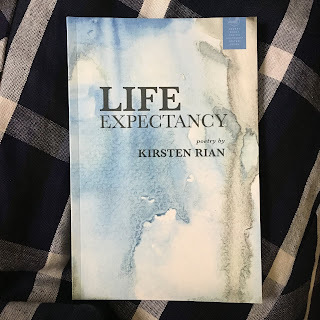 Kirsten Rian’s new book of poetry, Life Expectancy, explores family history, motherhood, and life taken in unexpected directions. The poems take many forms, some couplets, some dense “prose poems,” some looser and free-flowing. She uses the line breaks and white spaces as content, to provide emotional breathing room or add meaning to the stories being told. Both Kirsten and her son have lived with difficult medical issues, and her children’s father died young and suddenly. Her poems address these events, but the overall theme that emerges as she maneuvers through these physical and emotional complexities is the idea of mothering through trauma. Her instinctive understanding of how to be a fierce mother for her children when they needed her comes through in this powerful collection. Life Expectancy: Poetry is published by Redbat Books. Learn more about Kirsten Rian and her work as a writer, artist, singer, photography curator, professor, editor, and general Renaissance woman at her website, kirstenrian.com. I am glad to see a poetry book for Book Beginnings. The themes are some of the very ones in my book for this week.